The programme designer Assistant Headteacher, Mrs Joanne Lee, said 'We believe that for each pupil to succeed, the relationship between form tutor and pupil is vital. The Programme helps to strengthen the professional relationship between our pupils and their tutors, and enables our tutors to know the pupils as individuals, understanding the needs and aspirations of each pupil in their care'. Hannah, a Year 9 student, said 'I am choosing my options this year so I am anxious to make the right choices for me. I have had the same tutor for the last 3 years, so she knows me well; during my first session this year we have discussed my career aspirations and she is helping me to set appropriate challenging targets'. 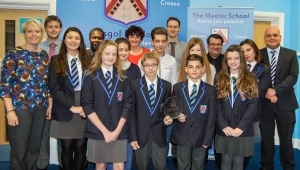 Assistant Headteacher, Mrs Lee, said 'It was a privilege to represent the tutors and pupils of our school. To be told we are leading the way in pastoral care in Wales was a huge compliment. The standard of entries was high, but I was hoping the judges would recognise the amount of work put in by our team of form tutors'.